BELCHERTOWN — With the sun streaming down and a slight autumn breeze in the air on Monday, it is not that surprising that the teachers at Swift River Elementary School wanted to get their students outside. What is more surprising is that they did not just go outside for recess, but to harvest kale that the students themselves planted in the spring — and that will be served up in the cafeteria on Wednesday as kale chips. 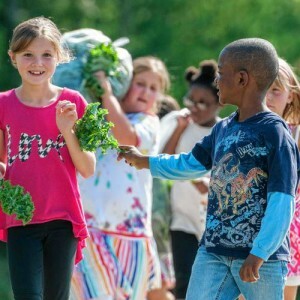 Almost 80 first- and second-graders gathered in the vegetable garden outside of the school on State Street Monday afternoon to help harvest eight bulging bags of kale for the cafeteria. Second-grade teacher Darryl Clark has been leading the work in the garden for a few years, with the help of a few other teachers, but this week’s kale harvest marks an important moment.